(3XL) BIG MAN Vintage Westren Shirt! 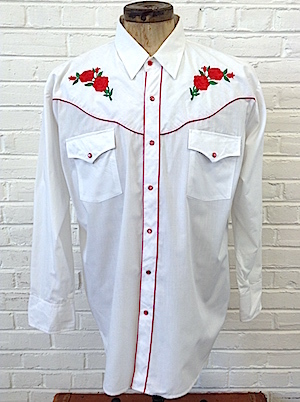 White w/ Embroidered Red Roses on Yoke! Home > Men's Vintage Shirts > Western Shirts > (3XL) BIG MAN Vintage Westren Shirt! 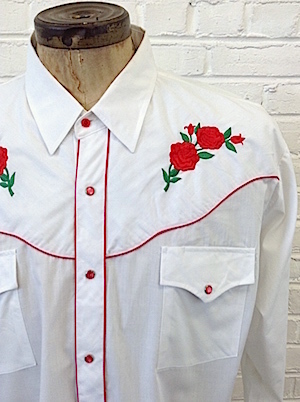 White w/ Embroidered Red Roses on Yoke! Vintage mens western shirt. 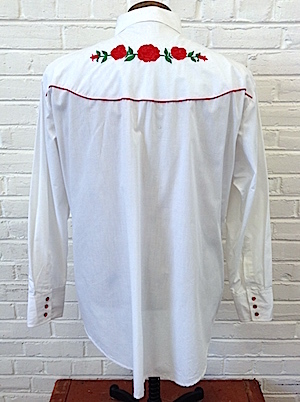 White with beautiful embroidered red roses on the front and back of the yoke. Closes in the front with pearly red snaps with three matching snaps on each cuff. Two front pockets with snap-closures on the chest. Yoke and placket are outlined with red piping. Tapered hem. Tagged by ElyNo material tag, but most likely 100% cotton. Condition: Very Good. Has a pinky print size light brown-ish stain on the lower right of the front of the shirt. Does not detract from the awesomeness of this shirt!